So I have hit the 100th person to ask me: Are you going to write a cook book?" or "When are you going to write a cook book?" I am celebrating this milestone (like celebrating the 100th person to cross the threshold of a new store or business) by chatting about it here. I have to say, "nah, not in my plans." I thought about it for a bit and here are my issues... issues, we always have issues! 1. I am a "just throw it in a bowl" kind of gal. For example, foods like cakes, cupcakes, cookies, muffins, and pancakes all have the same basic ingredients. Some have more liquid, i.e. pancakes, while others have more flour, i.e. cookies. What I throw in the bowl depends on the consistency of the batter or dough I am trying to make. Set batter aside for 5 - 10 minutes to see how the flour soaks up the liquid. After 10 minutes, if the consistency is cake like, good to go. If it is too runny, I add flour a tiny bit at a time. Too thick? I thin with a bit of milk. So, that is how I cook everything. A little of this and a little of that. Who wants a cook book written like this? I would get boo-ed and rotten tomatoes thrown at me! Most people want exact measurements. 2. Meal cooking is a process of looking at the local, seasonal produce on hand and having fun with it; playing with the ingredients, herbs, and spices. When you play with food for long enough, cooking and creating in the kitchen becomes second nature. I suggest picking up a couple of good vegetarian cook books* (cook books that show case seasonal produce) and then read them like novels. Next, get cooking. After a bit of practice in the seasonal kitchen, I will say it again, cooking becomes second nature. It is an art work. Relax, breathe deeply, and let your creative nature just flow. Add your favorite protein sources and whole grains to the yummy seasonal veggies and voila'... you have dinner (suggestion: make enough for lunch leftovers!). If you have blood sugar control challenges (diabetes) eat whole grains in serious moderation, not at every meal, and up the intake of veggies instead. 3. I visited the SLU book store and checked out the cook book section. It was scary! There were 5 shelving sections of cook books with 7 shelves in each section. 35 shelves of cook books and only 2 of the cook books on the shelves had more than one copy. One was the original MoosewoodCook Book the other was a smoothie "recipe book", I believe. All of those 35 shelves were loaded with single copies of cook books on every topic and health promoting diet imaginable! That was a huge wow for me! 3. I am all about making food an art form. The kitchen is your studio, food is your medium, and the kitchen utensils are your artist's tools! If the cook book uses refined ingredients (refined, all-purpose flour, bleached or not)... use your whole food kitchen skills and swap out the refined ingredients and add in 100% whole food ingredients. Need help with this? Give me a shout, read that section in my book (Hands On Health: Take Your Vibrant, Whole Health Back Into Your Healing Hands), or zap me an email and I will send you my educational handout. Get cooking like the seasonal kitchen artist you can be! PS My second book, a book of inspirational words to help you put the action steps in my first book, well... into action, was picked up by a publisher yesterday! Stay tuned as I keep you informed of the publishing process! I call this book of words my "yoga poses" for the body, mind, and spirit book. No, that is not the book's title... that secret will be released at a later date! Today, to celebrate, I am off to climb a high peak in those amazing ADK Mountains! White Face from last summer's hiking ... today I am going up Dial! Now that butter is on the cover of Time Magazine... it must be true! Butter is a superfood! Not that my butter eating habits are much of a secret anymore. I used to hide my butter habit to avoid the "you are going to clog your heart" advice and lectures. Not that I didn't pass out a few of the very same lectures in my days*, see below! A couple of years ago I wrote an article: "Unwrapping Butter's Bad Rap" for the Potsdam Food Co-op's newsletter, it became a blog post on Whole Food Healer, and was later revised and included in my first book. Butter is a head liner! I confess, I have always loved butter. I only refrained from butter when I was *eating a vegan diet (for a few years, back then, sometime in my past life!). That is over and butter was put back in my diet quite quickly. Mashed potatoes without butter? What is the point? I ate them, for years, at the Thanksgiving and Christmas dinner table. Not anymore, mashed potatoes with butter for me, please! Ok, it did work! Butter, nettles, and garlic scapes. Chives would be fine as well. Have patience with the food processor as olive oil blends with the herbs more easily. Try making the pesto with a 1/2 butter and 1/2 olive oil mix for easy blending! Local to me, NY State butter! This is my new favorite butter, thanks to Jessica Prosper of Prosper's Farmstead Creamery. She turned me on to this butter because the cows graze on grass and the butter is made just about 3 1/2 hours from my home. Now, if I had a farmer close by making butter with grazing cows cream, that would be even better! I buy in 2 pound tubs, a few tubs at a time. I do not like running out of butter. Makes me feel like an addict without my drug! Seriously, I am not that bad. But, humor is always good! Butter recently has had a big popularity boost with the Bullet Proof Coffee craze. I tried it, why not? I will try anything once! What I learned, butter is best eaten from the spoon, knife, or fork! Why ruin good butter or good coffee? Want fat in your coffee? Find a source of pasture-raised, whole cream or 1/2 and 1/2 and dose up your coffee in style. Coffe tastes better this way AND saves the mess in the kitchen making the bullet proof stuff. If you try bullet proof coffee and like it, go for it. on a piece of buckwheat toast. Organic buckwheat grown close to me, just over the border in Canada, and baked at Little Stream Bakery. Now the amount of butter on this 2 inch by 3 1/2 inch piece of toast was triple, what you see above, by the time I finished eating it. Maybe 2 1/2 to 3 Tbsp. of butter. Butter is definitely better on toast than in my coffee! PS Maybe Gardenshare has an more local source of NY State butter from grass fed cows? Aviva, any thoughts? I know Birdsfoot Farm has some very, deep-yellow cream from their grazing cow! I want local butter that is that deep yellow! Ok, so the butter was not fed the grass but the cows giving the cream were! As I have recommended using butter from grass fed cows and was only exposed to the Kerry Gold of Ireland... a conscientious Northern NY gal gently nudged me in the direction of this butter and NYS dairy. Kriemhild Dairy Butter is available at the Potsdam Food Coop, Potsdam, NY and through Wholeshare ordering with Nature's Storehouse, Canton, NY. 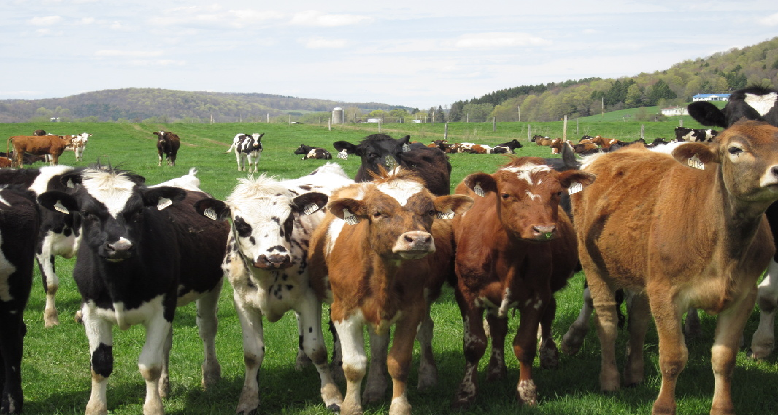 Kriemhild Dairy's multi-generational family farms are nestled in the verdant hills of New York State steeped in the tradition of dairy farming and production. Over a century of dairy farming experience and local, small batch production are the hallmarks of Kriemhild Dairy Farms. Handmade and packed in small batches. This butter has more sweet cream so the butter has a higher fat content, typically over 85%. "Our sweet cream, European style Meadow Butter is churned slowly and finished at a low level of moisture resulting in a rich flavorful butter. The higher fat content (85%) is coveted by chefs for its unique cooking properties. The butter is made throughout the grass growing season while our cows are grazing on high quality pastures, consuming the most nutritious mix of grasses. Since our cows graze seasonally you’ll see a range of colors from a deep golden color in the spring to a pale yellow in the fall. We do not add any other ingredients other than sweet cream from our grass fed milk and salt (except for the unsalted of course!). There are no trans fats in our natural butter. In fact, since our butter is made with milk from grass fed cows, it has a higher level of omega 3 fatty acids and conjugated linoleic acid (CLA's), the good fats our bodies need to digest nutrients." There are no preservatives in this unsalted butter. Kriemhild Dairy Farms strongly recommends that customers only keep out (refrigerated) what will be used in 2-4 weeks and leave the rest frozen. Fun, Easy Food with Lentils and Seasonal Veggies! 3. Add butter to lentils and mix in. 4. 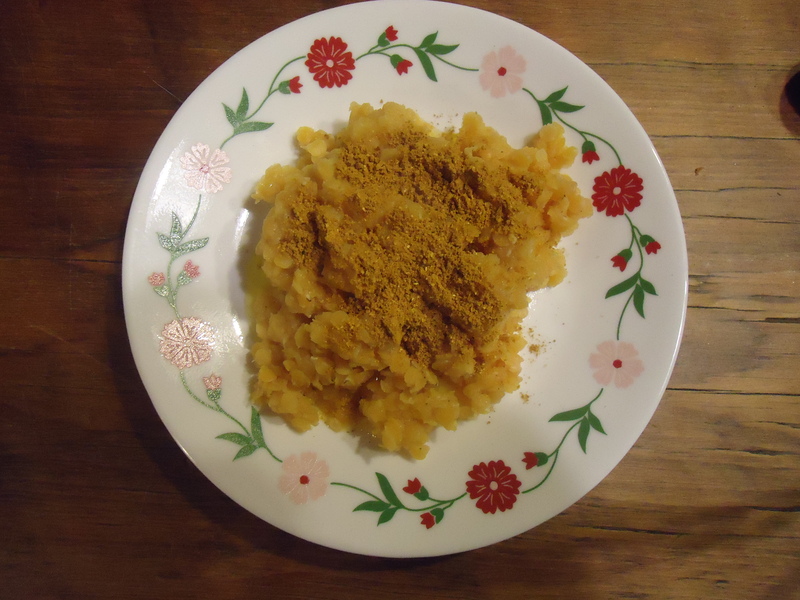 Sprinkle curry powder, to taste, over lentils and mix in. Tonight's taste sensation was slivered almonds and chopped cashews. Yes, I know these are far from local. I figure 85-90% of my food is from local farmers. A little nuts, once in a while, is a delicious indulgence! I served it with a shredded carrot and purple cabbage salad that I dressed with some raw sauerkraut. Sorry, forgot to take a picture of the salad before I ate it! It was so yummy, I could not wait! Boil 1 1/2 cups of water. Add 1 cup of red lentils. Bring water back to a simmer, gently. Keep pot covered, shut off heat, and allow lentils to "steep". Shred your carrots and cabbage to make your salad. Add shredded beets too for color, healing food, and another sweet taste in the salad. Chunks of chopped apples are fun too! When you are finished preparing the salad, put the lentil dish together, and enjoy. Eating seasonal foods makes meal preparation easier. When your choices are only what is growing locally, in season now OR what can be stored and eaten over the fall and winter, you save yourself from the tyranny of choices in the supermarket. When we change our food with the seasons, meal preparation becomes simpler! No more standing in the supermarket, overwhelmed by every fruit and vegetable that grows in every season, from every corner of the Earth, available to us every day. It makes our heads dizzy with what we are supposed to create for a meal tonight and every night this week. Go with local and seasonal. Your choices each season are slimmed down; planning and cooking becomes easier. The process, including eating, becomes more enjoyable. You will look forward to each season and what new taste sensations the season has to offer. I am also ready to say goodbye to "green" salads in the fall and I welcome the hearty taste of cabbage and root vegetable slaws. When spring comes, I crave those green salads again. The cycles of life are a beautiful thing!